This month in My Boys Tech Club my seven-year-old wants to tell you why he loves CROSSY ROAD with his top 5 facts. 1. The aim of the game is to cross roads, rail tracks and rivers by moving forward one step at a time, By tapping the screen you can also move in any direction by swiping, except diagonally. You have to try and go as far as possible without dying. My mummy says it reminds her of playing Frogger when she was younger. 2. On the roads are cars, lorries, bikes and buses going at different speeds but if you get hit or squished by one you die and the game is over. You also die if you get hit by a train but you get a warning of a red light that a train is coming; or if you fall in the river or land on a crocodile's head. 3. There are different themes including the Arctic, a rainy city, a big city, and the dessert, there is even an old-fashioned one in sepia and another that looks like Pac-Man. 4. There are coins on the roads, tracks and on the logs on the river. You get more characters every time you earn 100 coins. You do get to choose your characters it is a lottery. 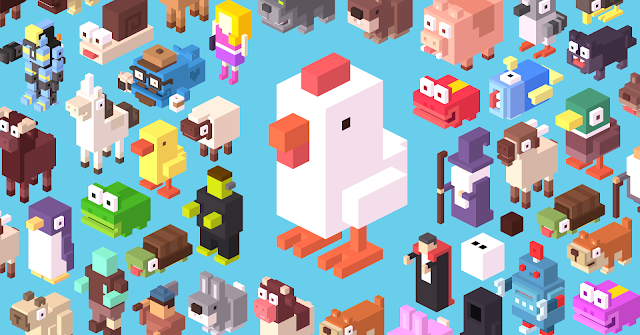 There are 174 characters that you can earn in total. 5. It is fun to play, my favourite character is the basketball player because when he gets squished the ball bounced away. The instructions are very easy to understand and I can play for an hour before I get bored. Cost: Game free to download. Time: Endless hours of fun.